I haven't talked about zombies on this blog in a while. In my defense, the horror movie season is still a few months away and so is The Walking Dead season 4 premiere. However, here we are in the middle of the summer and Brad Pitt is trying to survive a zombie apocalypse in a horror-drama adaptation of Max Brooks' book World War Z: An Oral History of the Zombie War. I'll be quite honest, I saw the preview on YouTube last year and I giggled in amusement: those zombies didn't just move fast - they might as well have been on steroids. My words were "This looks ridiculous! I'm going to have to see this!" The story is a rather traditional race against time to find "the cure" and save humans from extinction. The zombie virus has spread all around the world and different countries are dealing with it in different ways, but the movie focuses on Gerry Lane (Brad Pitt) - a U.N. worker investigating the virus. He is forced to leave his family for an indefinite amount of time and travel to various locations. The film is snippet of a time during the zombie apocalypse rather than a full start-to-finish story: we don't really get much information about how the epidemic started and we don't get to see it end. Let's get one thing out of the way: World War Z as a movie has almost nothing in common with the book, so I'm not even going to try to compare the two. When it comes to genre, this film is more of a drama/action than horror, which is unusual when it comes to zombies. I enjoyed it initially, when I first saw it, but the more I thought about it the more critical I got. Which brings me to my next, rather obvious, point: it took me way too long to write this review. The main reason was that I couldn't figure out how I felt about the film. On one hand, it was exciting to watch, not too gory, not too cliché and pretty well balanced. On the other hand, I can't shake the feeling of wasted potential, scenes that could have been more powerful, questions that could have been brought up as food for thought. I don't understand why they went for a PG-13 rating either - I think the story would have blossomed if it had a heavier, more "adult" approach. Speaking of heavy, apparently the ending was completely reworked: check out this article for more details. I wouldn't even say it's the ending that got reworked - it's about a third of the film, which would have completely changed everything. So much darker, more realistic (if such word can be used in reference to a zombie takeover), more thought-provoking - I would have honestly much rather seen the original version of the script brought to life, than what they ended up doing instead. Maybe it didn't fit the desired timeframe, maybe just it didn't work, maybe it was too controversial for mainstream summer blockbuster - who knows? I just hope at least some of it will be included as deleted scenes when it comes to the DVD release. Back to the theatrical cut of World War Z, I still think it's a fun film to watch. 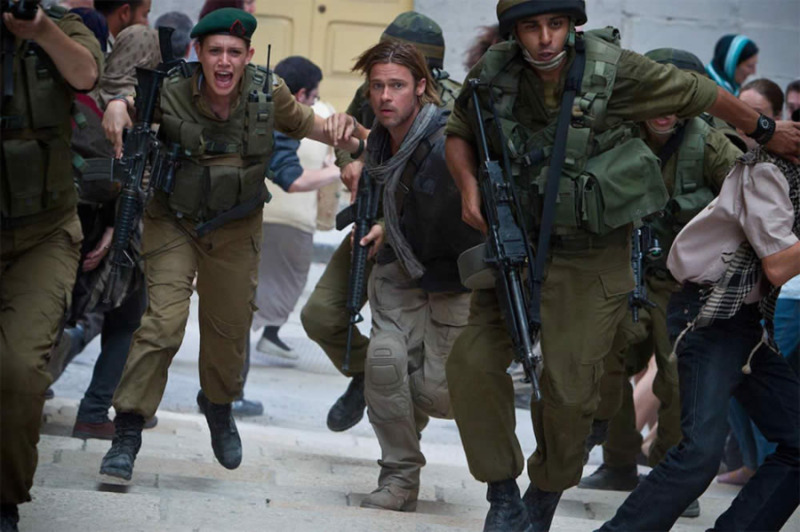 Brad Pitt is wonderful, as always, there is an young Israeli soldier named Segen (Daniella Kertesz), who I thought was excellent, zombies have a unique twist and the overall pace held my attention from beginning to end. The 3D was surprisingly decent - I didn't zone out of it like I normally do and I did have to dodge a few zombies, which is always fun. Some of the visual effects were a bit too obvious: I'm talking about the massive attacks of the undead (most are shown in the trailer), where the creatures look less like zombies and more like a CGI bug infestation. Overall, I give this movie a tentative thumbs up. It's a thumbs up because, regardless of the flaws, World War Z is a blast to watch on a big screen. It's tentative because it wasn't quite enough neither for a drama nor for horror action - plain and simple, I wanted more from the movie in general. However, here are two valuable lessons I have learned from it: don't be clumsy and, whatever you do, keep you phone on silent!